EXTENDED! 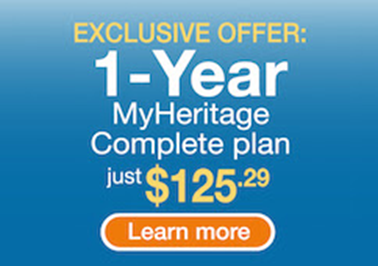 Get 50% Off MyHeritage Complete Plan! Are you a big fan of Christmas and the December holidays? Don’t you wish that sometime during the rest of the year you could just capture that spirit and wonder for one day? And how about the savings too! Take it from this Christmas Baby (true, I was born on December 25th . . .), I love thinking about Christmas when it is hot, hot, hot here in Chicago in July! So when the folks at MyHeritage approached me about doing an exclusive 50% off promotion, I said yes, but I have to make it “Christmasy.” They think I’m crazy, but that’s the fun of it right? Between now and Sunday, July 15th when the offer below expires, I’ll be posting more videos and articles on how I’m using MyHeritage for my personal genealogy research. If you’ve looked at MyHeritage in the past and didn’t think it was a good fit, I’m hoping to convince you otherwise – and save you some serious money! I always tell new, as well as experienced genealogists, that there is no “easy button” in genealogy and you need to work to find the answers you need. Plus you should spend time understanding all the features of a site like MyHeritage and maximize your time spent there. DNA Matching: MyHeritage is leading the way in the area of DNA including DNA Matching technology and more. I’ve found lots of new matches, and these are in the 1st to 3rd cousin range, not 4th to 6th cousin like AncestryDNA’s matching. Also, I love that DNA Matches allows me to see the surnames I have in common with my matches! Did you know there is NO CHARGE to upload your DNA test data from AncestryDNA and others to MyHeritage? True Worldwide Coverage: This is a big one for me especially as I am working on my European genealogy research. MyHeritage has over 96 million users, 9 Billion records from 48 different counties and an online community of users around the world. When I have questions about German archives and records, for example, I know I can get answers from other users on MyHeritage. SmartMatching™: Finds matching profiles in family trees, enabling users to discover new ancestors and relatives, and connect with other users. This matching happens in the background and I am notified via email. It is always exciting to find new ancestors this way! MyHeritage is a leading site for family history research and DNA testing. They offer many innovative tools for breaking through your brick walls and taking your genealogical research to the next level. Don’t miss this chance to access their collection of 9 billion international historical records and so much more! Click HERE to get your 50% off deal on the MyHeritage Complete package. This offer is for new subscribers only. The normal price is $250.74 USD and you’ll pay just $125.29. Join 96 million users who have already built family trees totaling 3 billion tree profiles, today. You don’t want to miss out on this deal! For a limited time, every Genealogy Bargains user can get a one-year Complete subscription for only $125. Act Now! Offer MUST END Sunday, July 15th! This is a limited time exclusive extended through Sunday, July 15th. Don’t put this off – get ready to get your genealogy game on and get everything you need at MyHeritage! Click HERE to get started today.